It took me 15 years to realize that my own hot tub kept falling ill to the typical manufacturer or industry recommendations for treating hot tub water. I had all the same symptoms of my customers… jeez got the typical leaking pump seals, o-rings going bad… all of it. As a repair guy I made it a point to follow the leaders in the chemical industry that support hot tubs and spas…. only to finally figure out that I’ve been doing it WRONG, for 15 years! Walk into any hot tub or pool store and it’s like a chemistry class… It’s turned us stupid people into money pits. The above photo is from a Hot Springs Spa manufactured in 1984. Look at that. So simple. And by the way… can anyone tell me what the hell “Metal-Out” is used for? You mean, I can’t drink from my hose in the back yard any more? There’s metal in the water from my spigot that must be eliminated? I had a customer that I visited a while back, and his equipment condition was literally perfect… a 15 year old Leisure Bay spa. The only thing wrong was his circ pump had quit and needed to be replaced. I asked him… what the hell are you doing to take care of your water? Your equipment is amazing! I tried everything the pool store told me to do. Used the internet, and nothing ever worked. Balancing according to their methods never worked for the first 2 years. But I used to own a swimming pool in my previous house, and I had some Chlorine tablets in a bucket. So I just beat them with a hammer and broke them up in pieces, and threw them in to keep the water sanitized. How did you monitor the chlorine level? Well I thought you were gonna give me a hard time about this, but what I do is I literally smell the water. If I smell a bit of Chlorine, then I know I’m good. 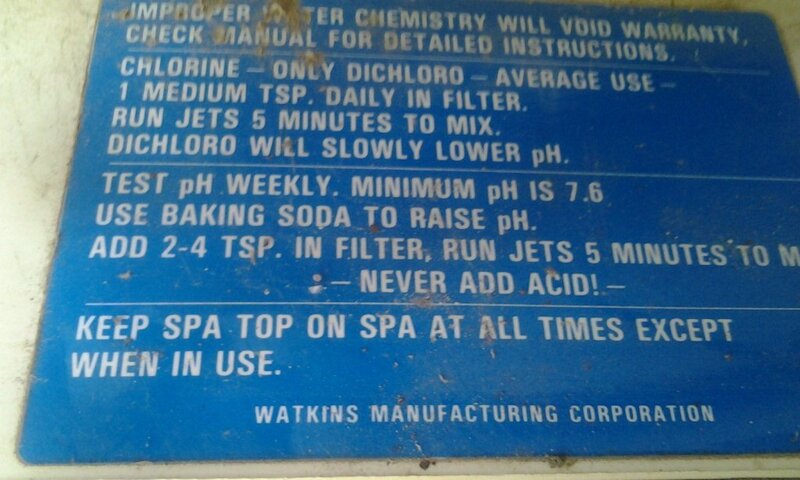 Wow, that bit even changed my own nature of advising customers about chlorine and sanitizing hot tubs. The only other advice I gave him was to add 2/3 small box of baking soda to his tub after draining and refilling the tub, to keep his ph from dropping to acid. Shortly there after, I had another customer with a similar problem, pump 1 was dead… but her equipment was literally in perfect condition, no corrosion, no mess… I was amazed at this. This almost 20 year old spa had never been worked on, and I asked her… HOW are you taking care of your water? She told me well… I tried what the spa store told me but after a while it didn’t work. I asked again… but how did you kill the bacteria and germs and stuff? Heh… classic. She said: I just put in some bleach every couple of weeks… The water in this hot tub was fabulous, the equipment had ZERO evidence of corrosion. Just a failed pump from years of use. I told her simply to add baking soda to the water when she refills the tub. Which brings me back to the original chemistry template that Hot Springs put out in 1984… Just do this one thing, and it will work. Hot Springs had it right from the beginning. Keep it small, keep it simple, and you will love your tub again! If you have a question about this simple solution for water chemistry then please give us a call any time.